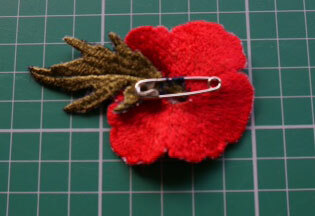 I wanted to create some applique poppies to place in the last set of the Fields of Poppies collection. My first attempt worked out reasonably well but the original poppies were too small so I enlarged both the poppies and filled out their leaves. I was still unhappy with the result as I had embroidered the petals on organza. I had to trim around the petals but this is not a full proof method as the odd stitch can get clipped, so I went back to edit the poppies so they can be stitched on wash away stabiliser so there is no trimming to do which keeps all your stitches safe. Unfortunately the poppies were too dense and I like my petals and leaves to be light for a natural look, so I resorted back to the organza. I used Aqua Magic for my stitch out and it rinses out easily. It is best to use red thread in your bobbin for the petals and green for the leaves so they look good both sides and there is no show through of thread. As the black stamens did not show significantly enough for me, the stitches have been increased so they stand out. 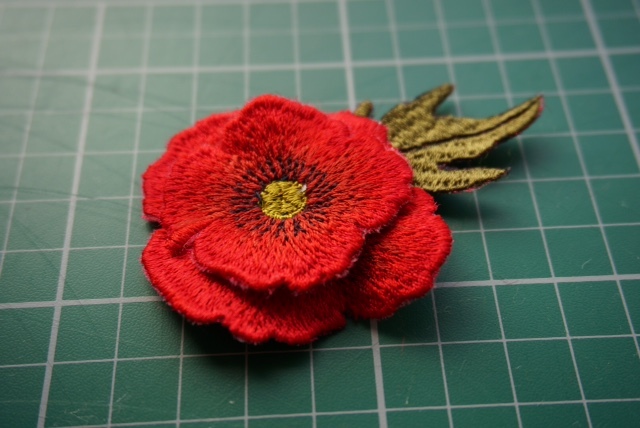 Use these applique designs to create full looking dimensional poppies for an applique brooch or decorate other designs in the collection with them. After you have trimmed away the excess organza I suggest that you use a felt pen to colours in around the edges to cover up any of the organza which may be still showing. Stitch the leaf and two layers together securely with double thread and attach a safety pin or brooch. I also added Fray Check on the edges of the back of the leaves and petals to make sure that none of my stitches would fray. Finally I added some on the stitching which secured the pin. 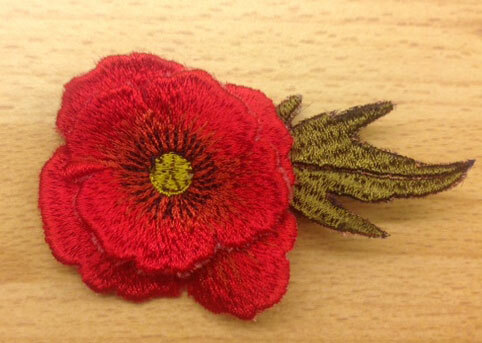 You may want to add a button or some dark beads or crystals to the poppy centre. Here is my completed poppy which I will wear with pride this week and until Remembrance Day which is on Sunday 9th November! This entry was posted in Embroidery projects and tagged 3 Dimensional embroidery. Bookmark the permalink. Stunning! A work of art. I will be wearing my brooch tomorrow night at the monthly R.A.F.A meeting. I am going to stitch it on red organza. Beautiful brooch Hazel. Is there any chance that you would release it as a single design please? So lovely like all you do, congrats. Thank you so much! I am delighted that you love my Poppy! Beautiful!! I have made several like this but with pansies. The trick to “cutting” them out is to use a wood burning tool along the edges. It melts the organza but leaves the embroidery untouched as long as you use a light touch.